Florida police have announced they are not looking for suspects in the case of four bodies found in James Blake’s burned home in Tampa. The four victims have been identified by relatives as a family who rented the home from tennis star James Blake. They spent $650 on fireworks days before the fire destroyed their home. Police officers say they believe the fire was started on purpose but would not say how or who was responsible. 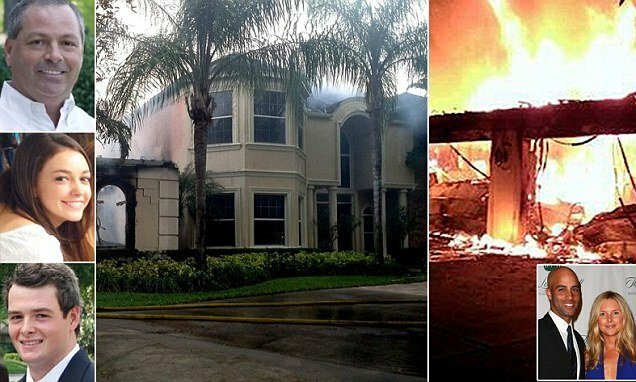 James Blake, 34, was not at the home inside a wealthily Tampa neighborhood at the time of the fire. James Blake had rented the $1.5 million home in Tampa to the Campbell family for the past two years. Darrin Campbell had been an executive for several high-profile companies around the US and his wife Kimberly, was a stay-at-home mom. They had two children, Colin, 19, and Megan, 15. Firefighters were called on Wednesday morning to the home. Neighbors told police they heard explosions coming from the house. Kimberly Campbell’s father, Gordon Lambie, told the Associated Press news agency the family had been close-knit and successful. Darrin Campbell had moved to Tampa more than 10 years ago to take a job with a glass container manufacturer, Gordon Lambie said, and held a few additional positions before he had taken the past year off work. On Thursday, Hillsborough County Sheriff’s Col. Donna Lusczynski described the fire as unusual and said there were “various fireworks” throughout the home. Two victims suffered from upper-body trauma, she added, but did not indicate whom. She also said no weapons had been found. A spokeswoman for the sheriff’s office said medical exams of the deceased were under way on Thursday. “We are not looking for any suspects, not at this point in the investigation,” Debbie Carter said. William Weimer, vice-president of Phantom fireworks, confirmed Darrin Campbell had bought fireworks on Sunday, describing them as the kind of fireworks usually set off in backyards. He said the fireworks could have started a fire but that it would have spread slowly.